Some Panamanians might think the way to show off their wealth and status is to drive around town in the latest edition SUV. 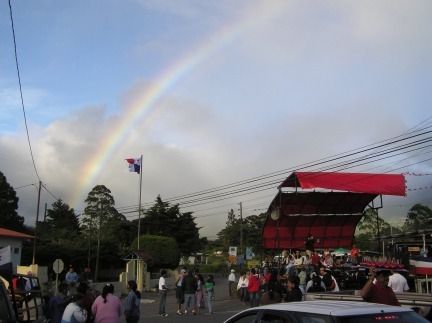 The people of the Chiriqui highlands also love to put on a show, but they do it with greater style and class. For their choice of transportation ostentation, they prefer the four-legged to the four wheeled. In Volcan they love their horses. Some locals I am told, have paid up to $10,000 for their very own piece of equine elegance. Visitors to this highland town can enjoy horse displays throughout the year. (the locals love to show them off any chance they get) The Cabalgata is one such show, timed to co-incide with the year-end national independence celebrations. The local tourist group, The Camara de Turismo de Tierra Altas, invited me to see the parade up-front and personal. Camara president, Anabella Rios de Esquivel, told me this particular parade had been celebrated in Volcan for the past 25 years. Up to five hundred local horse enthusiasts, decked out in their finest parade gear, trot, gallop or saunter down the main street of Volcan, to the appreciative applause of thousands of locals and tourists alike. The parade started at 4.30 in the afternoon and wound its way to the center of town. Pausing in front of the temporary parade stand set up in front of the police post. 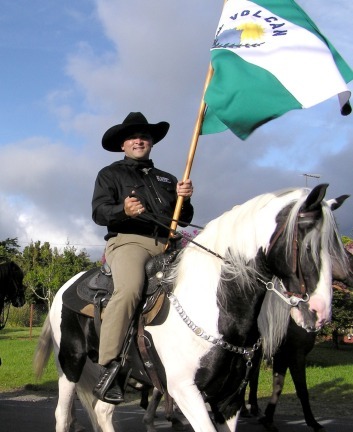 Paul Berard, the parade leader sat astride a magnificent, paso-fino pinto. Proudly carrying the standard he led his merry bunch of horse people through the town. 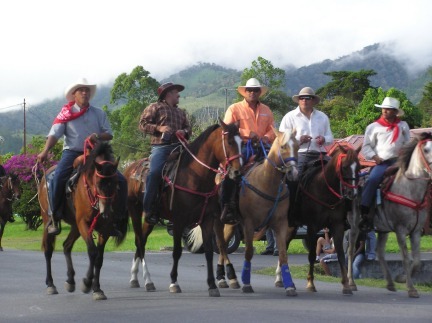 Paul is one of Volcan’s leading businessmen and the main supporter of the Chiriqui horse parades. His family roots are from the mountains of Switzerland, and Paul spent 8 years growing up in that European mountain wonderland. The parade atmosphere was heightened with the inclusion of three musical bands – conveniently transported in the back of pick up trucks. Anabella and I hitched a ride with local mariachi group “Mariachi Cielo Bugabeńo”. Pausing at the parade stand the band launched into a spirited version of Cielito Lindo. Paul Berard dismounted and walking onstage accepted the acclaim of the gathered crowd. Without Berard’s support of these events Volcan would lose a wonderful piece of local color and culture, not too mention a great tourist attraction. 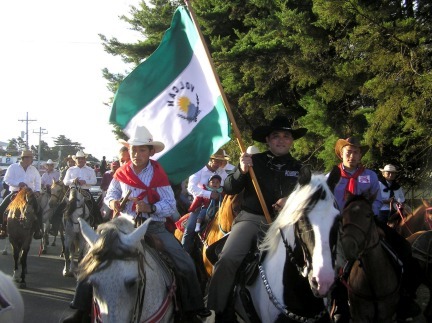 The horses were trying to trot as leisurely as possible – many riders did stop to accept donations of cerveza, this did little to slow the parade down and within ten minutes all horses had passed the parade stand. I felt a little disappointed the parade had ended so soon. Ah! but little did I realize the horses had gone around the block and were coming back toward the center for a second time. The evening sun was setting and a light drizzle did bring out a spectacular rainbow, arching high over the center of town. The mariachi’s had now been replaced by a small jazz band. The music was supplemented by several rockets firing into the air. These didn’t produce any multicolored aerial chrysanthemums, just some ear-numbing explosions. Visitors to the highlands can enjoy the sight of these fine creatures throughout the year. Next event is in nearby Concepcion on the 2, Feb. followed by the San Jose parade in David, March 16. In July, several provinces join forces for the festivities in Santiago and Finally there is the Rio Sereno parade October 18th. In the beginning of the year there is a three-day trip across mountains and beaches that starts in Costa Rica and ends in Punta Burica. This is true cowhand riding as the participants sleep each night, either on the beach, or in a mountain pasture. With the parade over, the crowds strolled happily home. The streets were soon deserted except for a few discarded banners, some beer bottles, and about 200 pounds or so of prime, organic, rose food. Now I realize why Volcan has such an abundance of beautiful flowers. Another reason to thank the Cabalgata horse parade.